Come join us for a Ceramics Class to create your very own fantasy castle. This class was so popular last time that we are offering it again. 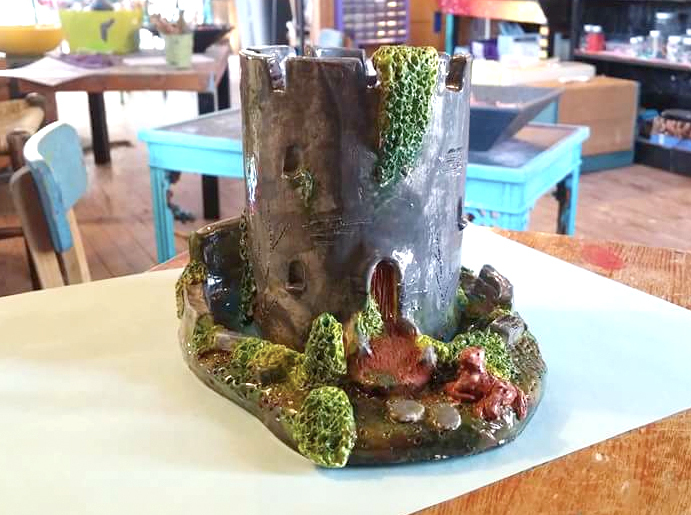 Learn the basics of texture, handbuilding, and manipulation of clay as Rachael walks you through making an awesome fantasy castle. You can make yours a planter, a vertical incense burner, a cup, or just a display piece- it’s up to you! Both Firings, and Glaze are included in the price – we will go over some different glaze techniques as well in class, but you won’t be able to glaze until it has been bisque fired (aprx 14 days). Space is limited, reserve your spot today! Price is $25 and includes all necessary supplies and 2 hours of hands-on instruction.